Italian Aerospace Network (IAN) attended for its second time SubCon Thailand, held from May 17th to 20th at BITEC, Bangkok, Thailand. 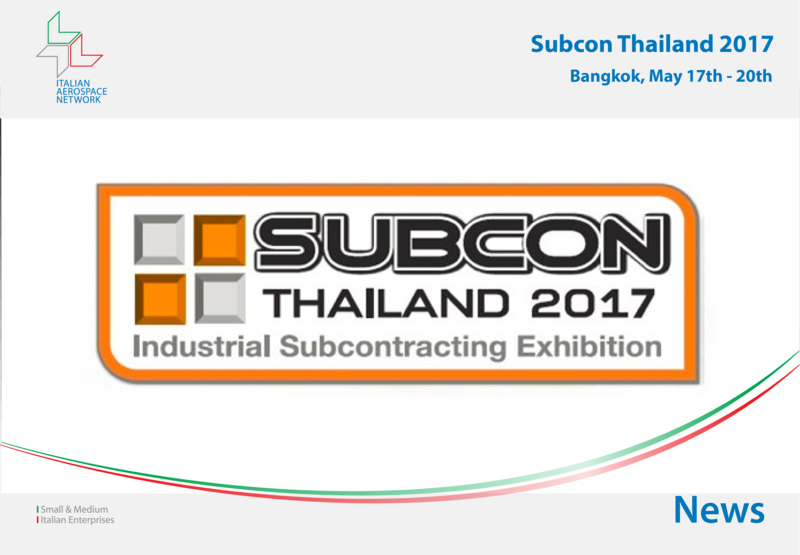 Organized by Thailand Board of Investment (BOI), SubCon Thailand is the largest international subcontracting event in the country and in the whole ASEAN region, attracting industry players from all over the World. IAN visits to Thailand starts with the visit of the Thai Airways MRO Center on May 15th, 2017, where the national airline maintains and repairs its aircraft’ fleet. The visit then continues on May 16th with the visit of AMATA, one of the largest industrial real estate developer with plans to develop the first Aviation City of Thailand, and COBRA, world leader composite material manufacturer. May 17th was filled with meetings between IAN delegates and SubCon’s participants and made even greater by the meeting with BOI Secretary General, Ms. Hirunya Suchinai. IAN delegation invited by BOI was composed by President Mr. Andrea Spiriti, Secretary General Mr. Riccardo Coli, Italian Coordinator Mr. Erminio Zanenga, ISC147 Training Manager Mr. EliaVantini and LOGIC Commercial Director Mr. Luca Boccola. IAN was praised by the local Thai newspaper SiamRat for its visit to Thailand together with BOI. Read the news on WeChat!